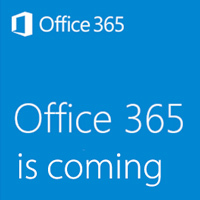 Office 365 is coming; early opt-in is now open. As part of the global Office 365 rollout, as of Oct. 17, all current Webster University students, faculty, and staff are eligible to opt-in for certain Office 365 services before their scheduled rollout date (view the mandatory rollout schedule here). What Will Opt-In Get Me? Opt-In to Office 365 will include access to Office Pro Plus, 50 GB of storage with One Drive, and an increased level of security and ease of use with password synchronization and self-service password reset. ou will receive an email notification when your request has been completed along with instructions on setting your security questions, changing your password, and accessing Office 365 services. If you have any questions regarding Office 365, please contact the team at office365@webster.edu.